How Do I Establish Healthy Boundaries in My Open Adoption? No two open adoptions will look the same. There are so many different ideas of what an open adoption should look like, all spurred by the wants and needs of both adoptive and birth families. Tensions arise when the terms of an open adoption are not firmly outlined at the beginning of a process or when one or more of the parties is not respectful of boundaries. It is important to spell out expectations of all involved before the adoption occurs. Making expectations and boundaries as clear and detailed as possible will be incredibly important. The more detailed an open adoption can be, the fewer chance situations might arise that will cause distress. When many involved in the adoption process consider an open adoption, especially with an infant, they often forget that the child will grow up. Relationships will change and people’s lives may change along with it. As the child grows, their wants and needs will need to be considered within the open adoption. To establish healthy boundaries, it will be important to account for this ebb and flow. How will the open adoption change over the years? Adoptive parents, how will you react if your child wants to have visits when they are older if that was not part of the plan? Birth parents, how will you respond if it becomes the child’s desire to change terms of the openness? 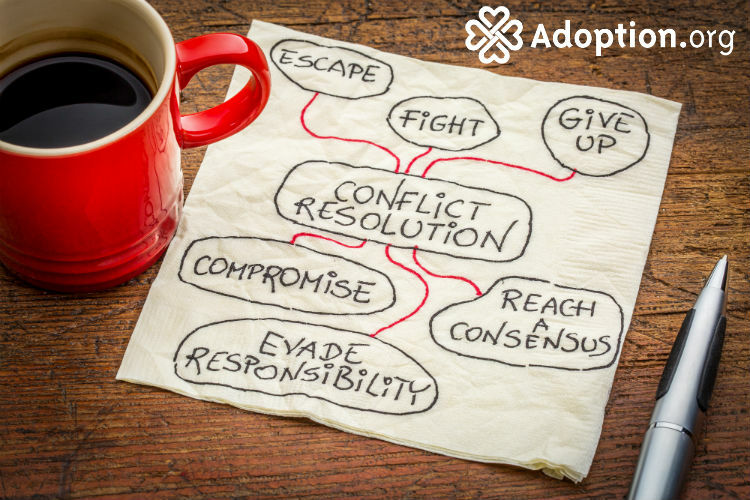 To establish healthy boundaries in an open adoption, make an open adoption plan. Even though these plans are not generally legally enforceable, it is important that all sides know the expectations. Discuss if the open adoption will include visits and how often. Discuss what will happen if a party moves or has a relationship change such as a divorce. Plan for the unexpected. It is also important to be boldly honest about your hopes and expectations. While it may be tempting to “play nice” in the beginning, this will serve no one. If you do not plan on always upholding an agreed upon term of an open adoption, do not promise that term. Make no promises that you do not fully intend on keeping. It is common for it to take a while to get one’s footing when an open adoption is in full swing. Even the best laid plans can encounter the unexpected. Communication and honesty will be key in this situation. If you encounter something that makes you uncomfortable, or if you feel that boundaries are being breached, say something. Do not let things go until they become a larger problem. This will only hurt your child in the end. If you are still in the earlier stages of your adoption, utilize your adoption agency or attorney if you feel you need third-party intervention. Many agencies and attorneys will be very helpful for years after an adoption is finalized. Communication, honesty, and preparation will mean everything in establishing and maintaining healthy boundaries.